Not a morning person? Running late? 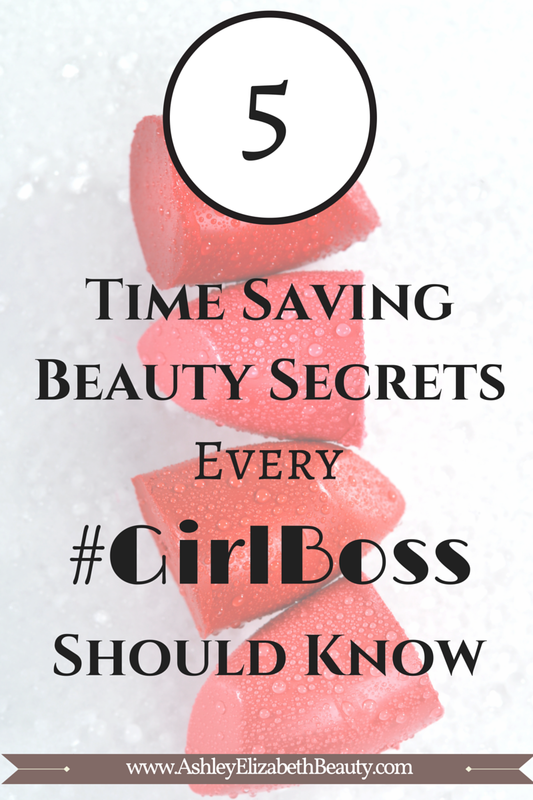 These beauty tips are little ways that can streamline your beauty routine and save you a lot of time every morning. These get-gorgeous beauty tricks are guaranteed to shave off minutes and save your sanity on those crazy mornings. If you need to save time in the morning one of the most effective ways to do so is to skip shampooing. If I wake up late one of the first things I am NOT doing is shampooing my hair. Shower with your hair in a bun and pull the top half back in a clip while you are getting ready. When you are ready to do your hair, spray in some dry shampoo style as desired, and you're ready to go! The absolute best dry shampoo I have tried is from Batiste. Their dry shampoo comes in Original, Strength and Shine, Light and Blonde, and Dark Brown and Deep. I prefer the Dark Brown for my brunette hair, but there is quite literally several more scents and colors available for every hair color and type. Skip the brushes and just use a Beauty Blender and your fingers to apply your makeup. A Beauty Blender helps to easily and quickly blend your makeup, saving time trying to blend it out with a brush. Apply moisturizer and primer with your fingers, and then foundation and concealer with a beauty blender. Of course, you will still need brushes to apply blush or any other powder products, but you have just saved yourself several minutes by using your fingers and a beauty blender to apply the liquid products. As you are getting ready let your hair air dry, or dry as much as possible and then blow dry, and pull your hair into a clean and sleek top bun. I have done this so on many mornings when I simply run out of time to do my hair. To make things even easier, I use a Hair Bun Maker. Put your hair into a ponytail, insert your hair into the opening, and then twist upward until you reach the end of your ponytail and secure wit bobby pins. Use L'Oreal Elnett All Day Volume Hairspray to tame any fly-aways or loose strands, it gives great hold without making your hair crunchy looking. In a rush without any time to apply foundation or concealer? A tinted moisturizer is your best friend. It will give color to your face and hide any slight imperfections like dark spots or discoloration, and also hydrate and moisturize all day. Use this in place of foundation and concealer and you will save yourself several minutes of time in the morning. My holy grail tinted moisturizer has been NARS Pure Radiant Tinted Moisturizer in the shade St. Moritz. It is lightweight, makes my skin glow but not look oily, and contains SPF 30. A good drugstore dupe is the ELF Tinted Moisturizer, which contains SPF 20, aloe, cucumber, and vitamins A, C, and E.
One of the beauty musts that I absolutely hate doing is shaving my legs. However, it is a ritual I must perform every day, and I have found a product that has made it much easier. For about five years now I have been using Schick Intuition Naturals Sensitive Skin Razor. My sensitive skin has never broken out while using this razor, and the razor refills let me cut out the time I would have spent applying shaving cream to my legs. What tips and tricks do you use to streamline your beauty routine?